Sunny skies. High 88F. Winds SW at 10 to 20 mph..
A mostly clear sky. Low around 55F. Winds S at 10 to 15 mph. 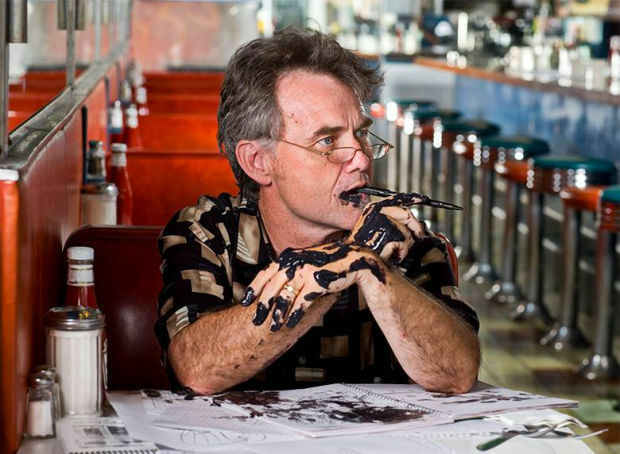 David Fitzsimmons, Tucson’s most beloved ink-stained wretch. I’m officially an old buzzard. I got invited to host the Pima Council on Aging gala next week. I’m honored. I realized I was getting old when I was told by a punk, a whippersnapper, a mere child, that I qualified for the Goodwill senior discount. Over and over. Repeatedly. And louder, please. Because I couldn’t hear him the first time. I dread the mailbox now. AARP mailers. Retirement advice. Free dinner! You don’t want to burden your loved one with funerary expenses, now do you? Most of my mailers are from a sales team of pyromaniacs happy to cremate me at an amazingly low, low price. I keep every envelope, card, notice and flier from every capitalist hoping to cash in on my imminent demise. I’m soundproofing my 15 X 15 bomb shelter with them. So I won’t hear the screams of the millennials when they inherit the earth I left them up above. I’ll have to drive to La Paloma for the gala. I’ve become the driver I used to dread getting behind in traffic. I leave early. Poke along. When I was stressed out and young, I’d pray for a grenade launcher to take a whistling geezer like me off the road with a sweet ker-blooey. A few weeks ago I gave a talk at a beautiful retirement home. “Who’s the oldest person here? Raise your cane.” A very healthy senior citizen said, “Me! I’m 101.” It’s cool to meet someone with wisdom, historical insight and titanium hips. Then some buzzard in the back shouted, “The hell he is. I’m 104. He can’t wait to be the oldest guy here.” Calm down. I learned suspender-snapping and walker-jousting are prohibited. I’m 63. When I look in the mirror I see the wrinkled old Master Sergeant grinning back at me. When I visit schools, I get questions I didn’t used to get. I tell the rugrats I’m so old the first time I visited Old Tucson it was New Tucson. The Arizona-Sonora Desert Museum’s Raptor free flight show featured pterodactyls. I remember unloading crates of Metamucil off of steamships from Yuma down along the Santa Cruz River when it was running year-round, flowing like a well-maintained urinary tract, catheterized with a lubricated antibacterial hydrophilic catheter. I’m incredibly blessed that nice people remind me I’m aging all the time. Full-grown, gray-haired adults will approach me and tell me that, “many, many, many years ago — a century, in fact, maybe it was eons ago,” I came to their school to speak, and they never forgot it. Drew on the cave wall. Fred Flintstone was there. Barney and Betty, too. Wilma held the torch. Don’t read me wrong. I’m happy to be old enough to host the Pima Council on Aging gala. And I’m proud I outlived half the saguaros in Sabino Canyon. And like an old saguaro, I have an elf owl roosting in my ear, my left arm fell off and a Gila woodpecker is giving me such a pounding headache. I Googled the Pima Council on Aging with these concerns. They had all the answers. If you’re aging and you need a resource, it’s there. Every possible thing. I have just one criticism. Which is unusual for an old person like myself. (I usually have hundreds.) They should make all the type on their website the size of the “A” on “A” Mountain. Dave Fitzsimmons will be hosting the 2019 Pima Council on Aging Gala, "EngAGING together", on Saturday April 13th, at Westin La Paloma. PCOA is celebrating the good work that has been done and raising funds to continue serving older people and their families. This year’s event will feature live music from "80s and Gentleman". Black tie optional.